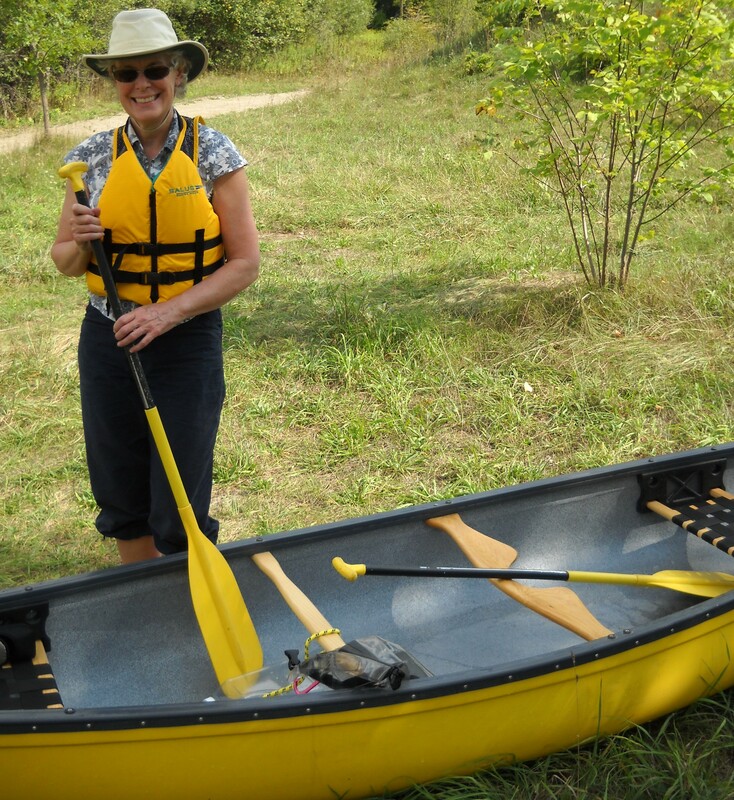 I haven’t done as much canoeing as I would have liked over my six and a half decades on the planet. For example, I’ve never gone wilderness-tripping. However, I have canoed since camping as a youngster. 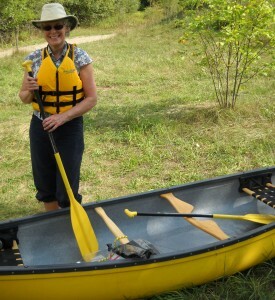 My partner Lois canoed growing up during summers at her family cottage on Lake of Bays. For a couple of years she owned a yellow canoe. 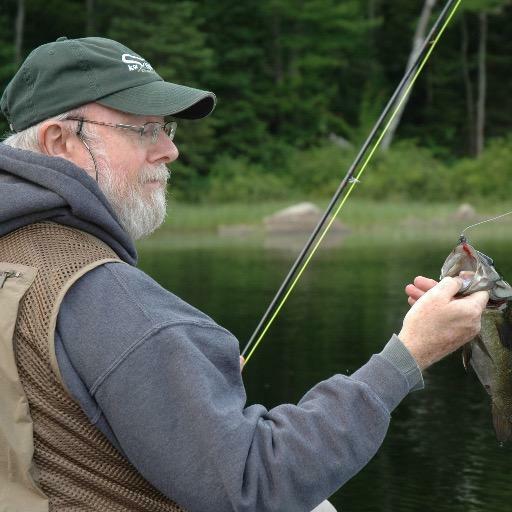 As an avid fly angler, I like fishing from a canoe on a lake almost as much as wading rivers. 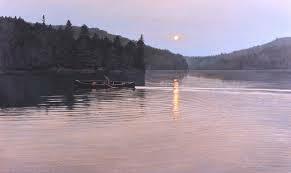 I also enjoy the canoe through books, music and the visual arts. In my imagination, the canoe is connected to my deep love of fresh water — streams, rivers and lakes. My interest in both the canoe and canoeing has made the annual KW Canoe Symposium a must-attend event every spring since its inception five years ago. It’s impossible to imagine Canada without the canoe. It’s not an exaggeration to refer to this vast country of ours as Land of the Canoe. The canoe is more than an effective means of transportation — a harmonious blend of form and function, history and geography, design and craft — ideally adapted to the landscape. It played a critical role in nation building by shaping the country through exploration and settlement, trade and commerce, war and recreation, sport and art. It’s a link between First Nations people and European pioneers. As image, metaphor and symbol it finds expression through story, poetry and song, drawing, painting and sculpture. Waterloo elementary school teacher and avid canoeist David Blain is the founder of the canoe symposium which returns to Waterloo’s Princess Twin on April 16. As in the previous four years, it’s sold out. Blain’s objective is as simple and elegant as the canoe’s design: ‘To raise awareness about something with deep cultural roots in this country that has remained a central element in our identity,’ he once told me in an interview. The symposium’s success isn’t surprising. The Grand River played a crucial role in the history and development of Waterloo Region. The designated Canadian Heritage River remains the aorta of water recreation and sport in the region, supporting hiking, canoeing, kayaking, fishing and birdwatching. The historic watershed is home to outfitters, fishing and fly shops, custom canoe builders, paddle carvers and personal flotation manufacturers, not to mention organizations such as the Waterloo Wellington Canoe & Kayak Club, Old Salts Seniors Canoe Club and Ancient Mariners Canoe Club. There’s even an annual film festival devoted to paddlesports (The Reel Padding Festival) presented by the Princess Cinemas. Discover how Evan Holt’s love of canoeing turned into sharing his passion with others while learning about the Canadian Canoe Museum in Peterborough, Ontario. Holt, who is creative projects manager at the canoe museum, shares his enjoyment of the outdoors through his website www.traversing.ca. Since breaking out of her corporate office, Kate Ming-Sun has flourished from time spent in nature and on the water. A guide with Wild Women Expeditions, she maintains her Write-In-The-Rain blog. Gary Johnston shares some of the interesting sights to be found in the local Grand River watershed. Like the well-known Bucket List, Johnson’s Canoe-To-Do List is a goal-setting method to motivate paddling. Johnston is a member of the Waterloo Wellington Canoe & Kayak Club. 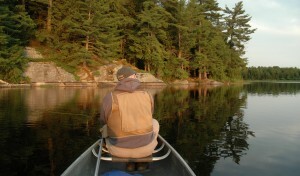 It’s difficult to share the richness of solo canoeing. It’s easy to communicate the technical details, swap stories and talk gear. But to capture the spirit, you have to experience it firsthand — or there’s Ian Hanna’s Schrodinger’s Paddler. Hanna has been solo canoe tripping for four decades. Humans have a long history with wolves, but sadly wolves have suffered. Research in Algonquin Park not only provides insight into the ecology of wolves, but offers an opportunity to appreciate wolves. David LeGros, the Natural Heritage Education Specialist for the provincial park, is in charge of leading a team of naturalists who conduct educational programs. He has also led a number of wolf howls in the park. Brad Jennings and Leah Schmidt embark on a journey to regions seldom paddled. They highlight the challenges and rewards of venturing off the beaten path and exploring uncharted backcountry. An avid paddler and adventure racer, Jennings has parlayed his passion for the outdoors into studying for his masters degree in environmental science and biogeochemistry at Trent University. Schmidt has been paddling for ten years, but her most adventurous tripping experiences have been within the last three. Doors open at 9:30 am. Speakers start at 10 am and continue to 3:30 pm with an hour lunch break. Lobby displays include Handcrafted Canoes, See Sawyer Run and Canadian Canoe Museum.